Grappling/MMA dummies are great to drill on and are even a greater tool if you do not have the time to go your gym. These dummies are great to practice drills and throws on. And they are great for conditioning if you just spend a few minutes a day throwing them around. However, these dummies are not to replace your actual training partners. They are only to supplement your training as well as continue your development and progress away from your martial arts academy. A common misconception by individuals unfamiliar with training dummies is that they are all the same. This is far from the truth. These dummies have been created with a variety of characteristics that makes them unmistakably different from one another. Furthermore, their design makes them suitable for different types of combat training, such as takedowns and striking. This review article will examine 6 training dummies catered to grappling and MMA enthusiasts. The table below provides a brief overview of each dummy but please do scroll down to read the thorough review of each grappling dummy. Before jumping directly into the review of specific training dummies, this section will list features important for evaluating what type of training dummies fit your needs best. Dimension and Size: It is important to always examine the dummy’s dimensions and determine if it is the appropriate size for you and your intended use. Weight: During your dummy selection process, do not forget to account for the dummy’s dead weight. Unlike trying to pick up a teammate, the dead weight feels heavier and is harder to throw and perform takedowns. Many training dummy owners suggest that you multiply the dummy’s listed weight by 2 to gauge how heavy it will feel during practice. Durability: A product made with durable material can handle being used repeatedly and is more resistant to wear and tear. Stitching Quality: A dummy that has high stitching quality with multiple rows of stitching and reinforcement in high stress areas is much better at taking the abuse from being thrown and slammed on the ground. Limbs: Training dummies with limbs allow you to practice submission techniques like joint locks. 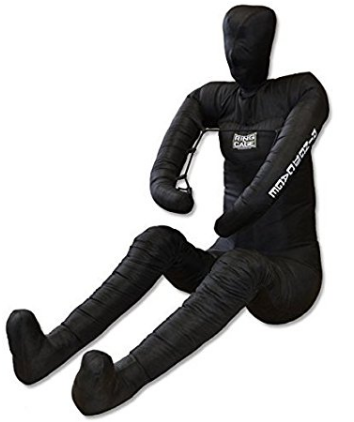 In addition to that, these types of dummies could be clothed with a Jiu Jitsu or Judo uniform (gi), which is great for practicing specific gi techniques. 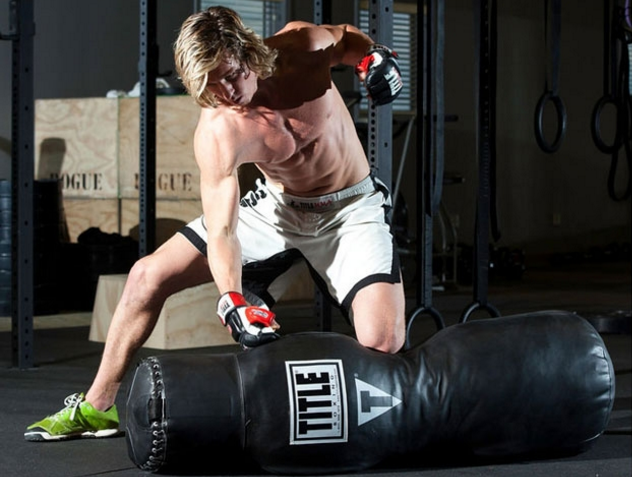 The Revgear training dummy, also known as the “fitness pod,” has been adopted as a training tool for various martial arts and fitness gyms. Its design integrates conveniently positioned handles that are useful for MMA practice and fitness workouts. The video below shows you a quick sample of how this Revgear product could be utilized to improve your striking and throwing techniques. Handles: Handles could be used for throwing practice and as extra grips for striking. This Title training dummy stands out from the other options because it could also be used as a heavy bag. The top of this product has three rings for hanging it onto a heavy bag stand or from the ceiling. Without handles and limbs present, this Title dummy is limited in its use for submission grappling drills. The following video consists of a professional MMA fighter demonstrating, on a similar shaped dummy, how this type of dummy can be integrated into your MMA training routine. ​Material - Nylon hanging straps utilizing a hook and loop design with D-shaped metal rings. Pocket Design - Upon using the Title dummy for takedowns and groundwork, the metal rings can be inserted into pockets on top of the bag that were designed to firmly hold it in place. Attachments - The metal chains and swivel for using this dummy product as a heavy bag is included. 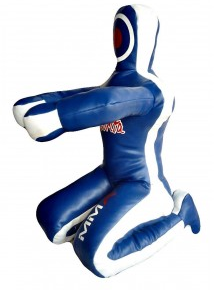 Combat Sports legged grappling dummy is a versatile product designed to endure throws, takedowns and strikes. Unlike the previous two dummies, this one has limbs for practicing submissions as well. The video below shows an demonstration on how to use this type of training dummy to improve your throwing skills. 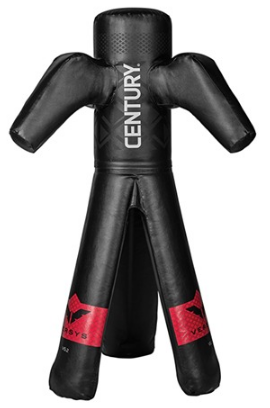 Century has different types of training dummy with features similar to the model we will be reviewing here. They differ in shapes, sizes, weights and features, such as arms and head piece. For this review, we will be focusing on the model named Versys VS.2. The Versys VS.2’s third leg is a distinct feature that grants it the ability to stay standing. Unlike the rest of the training dummies shown in this article, the VS.2 is also designed with portability in mind. The three legs could be folded together and you could separate the body from the legs by simply unzipping the zipper at its waistline. Century’s video clip below shows this training dummy as well as similar models and how they could be used to improve your martial arts ability. 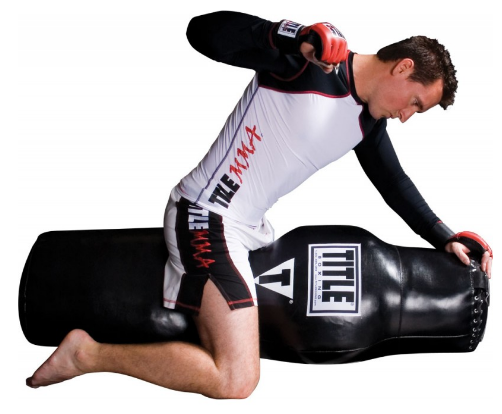 Celebrita MMA’s grappling dummy is created with life-like characteristics. The ability to bend its legs means you have a wide variety of wrestling and Jiu Jitsu techniques that could be drilled with this dummy. An important thing to note is that it will be delivered to you “unfilled.” Therefore, you will have to open up this dummy via the zipper on its back and put in the appropriate filler material. The subsequent video shows an individual demonstrating how this dummy could be used for MMA and submission grappling training. This dummy is a hand constructed product consisting of a high quality material called Denier Cordura that is resistant to wear and tear. The primary purpose of this dummy is to sharpen your submission skills. Use it to drill techniques taught in class or from external sources like Jiu Jitsu ﻿﻿books or DVDs. You can purchase this product pre-filled or unfilled. Unfilled is the cheaper route if you have household items that you think will make great filler material. The video below shows a Jiu Jitsu practitioner performing leg locks on a similar grappling dummy.